Researchers in the Mississippi Agricultural and Forestry Experiment Station have utilized the principles, technologies, tools and innovations associated with precision agriculture for several years. As precision agriculture continues to advance, MAFES scientists and MSU remain at the forefront of the booming industry. Several precision agriculture initiatives are currently taking place at MSU. 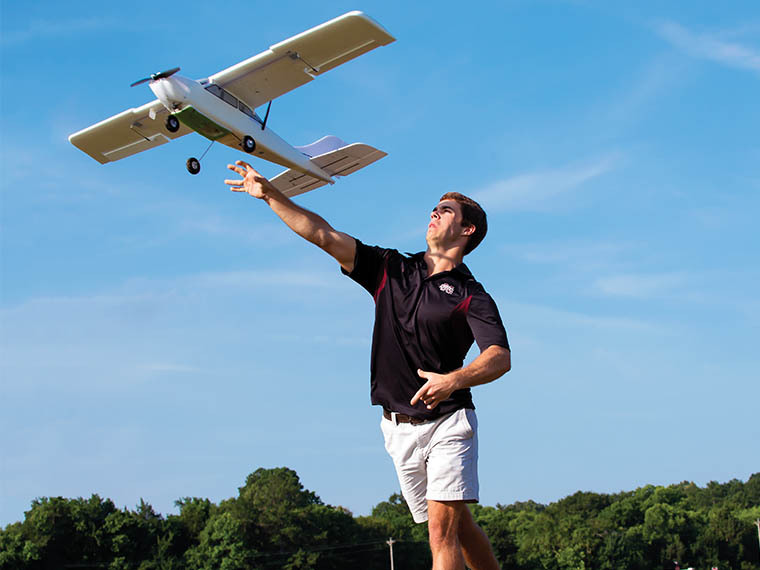 MSU has partnered with Hinds Community College in a TWO+TWO program (two years at Hinds and two years at MSU) in Precision Agriculture for agricultural and biological engineering majors. MSU is exploring another possible precision agriculture program with East Mississippi Community College. Private donors are assisting the university in precision agriculture curriculum enhancements. A gift from Monsanto Corporation is providing scholarships for undergraduate and graduate education in precision agriculture. The Monsanto Company established five $2,500 annual scholarships to encourage students in this emerging field. The Diane Hawks Precision Agriculture Curriculum Endowment, a recent gift from Diane Hawks, will help establish the precision agriculture certificate program. Hawks was raised on a farm in rural Desoto county and continued working in agriculture into her adult life before pursuing an influential career in the political sector. The College of Agriculture and Life Sciences, or CALS, which currently offers a precision agriculture concentration for agricultural engineering majors, is planning an interdisciplinary precision agriculture certificate program available in 2016. The certificate will include four CALS departments: Agricultural and Biological Engineering; Agricultural Economics; Biochemistry, Molecular Biology, Entomology and Plant Pathology and Plant and Soil Sciences. There will be opportunities to partner with the MSU Bagley College of Engineering as well. MAFES has allocated a $150,000 per year/multi-investigator/multi-departmental SRI award for precision agriculture research projects with funding beginning in Spring 2015. The first award funded was for Precision corn management technologies with spatially explicit production budgets. Investigators include Brien Henry and Michael Cox, plant and soil sciences; Jason Ward, agricultural and biological engineering; Robert Moorhead, Geosystems Research Institute; Keith Coble, Jesse Tack, and Barry Barnett, agricultural economics. Three faculty positions will be repurposed toward Precision Agriculture emphasis areas; one position in plant and soil sciences, one position in plant and soil sciences at the Delta Research and Extension Center and one in agricultural and biological engineering. A fourth position of a split MAFES/Extension appointment with a precision agriculture focus has been designated at the Delta Research and Extension Center. Two faculty positions in the Geosystems Research Institute are being developed for targeted hiring in cooperation with MAFES and Extension. MAFES is also working with the Department of Agricultural Economics to identify faculty that can address the economic impact of precision agriculture technology adoption. MAFES scientists are trying to solve big questions surrounding big data. Keith Coble, Barry Barnett, Jesse Tack and Ardian Harri in the Department of Agricultural Economics are investigating how big data may influence, inform and possibly transform agency reports released by the USDA. In a cooperative agreement between MSU and the Office of the USDA Chief Economist, the researchers are exploring, on a macro level, how the technology and proprietary information that is generated through big data might affect the current USDA reporting system.